Of all employee entitlements, paid parental leave (PPL) results in the greatest divide. The mere suggestion invariably gives rise to an emotive verbal tirade. Eva Cripps calls on the Abbott government to get the balance right. SICK LEAVE, carers leave, recreation leave, annual leave loading, flexible work hours: none of these employee rights and benefits cause the same affront as paid parental leave. However, given other workplace rights have taken decades, if not a century to embed, it is unsurprising that the comparatively recent introduction of PPL causes so much controversy. 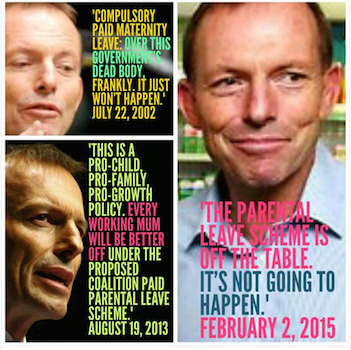 In the latest setback for improved workforce participation, the Abbott Government’s recent claim that 50 per cent of new mothers are “double-dipping” and “rorting the system”, has set women against women, parents against parents, and neighbours against neighbours. The angst crosses demographics, socio-economic status and generations. Mothers who currently have access to employer and federally funded schemes are angry at the suggestion they acted fraudulently in claiming their legal entitlement. Many parents without employer PPL believe the complementary system causes inequality. Parents of children born before 1 January 2011, are vaguely indifferent but some proclaim that they managed without paid leave so why should others receive support. Surprisingly, others still claim that once a woman reproduces she should leave the workforce altogether. And all the while, opponents ignore the fact that a complementary system of paid parental leave has huge benefits cost-wise to the government, to business and to families. Assisting families with the cost of raising children is nothing new. Many parents benefited from the Dependent Spouse Tax Rebate, replaced in 1993 with the Home Child Care Allowance, and then again in 2000 with Family Tax Benefit A and B. The concept of a baby bonus is also not new. The Australian Government paid £5 per child in 1912 to all parents regardless of work or marital status. The recent incarnation of the baby bonus, introduced in 2002 and scrapped in 2014 was aimed at addressing the falling birth rate thus offsetting an aging population. The Abbott Government’s Mother’s Day attack on working parents shows a distinct lack of value for families. It demonstrates a backflip on support for mothers spending a vital six months at home with a new baby. It shows contempt for employers providing better working conditions and benefits for employees. It creates a maximum entitlement, rather than a minimum. One of the many gaffes by Tony Abbott written as a university student the 1970s. Même by mogantosh.com. Paid parental leave has a different focus to other family payments. It is no longer practical or desirable for many women to be stay-at-home mothers and housewives. The economy is now based on two incomes, and it makes sense to put in place mechanisms to support women staying in the work force. The World Health Organisation recommends primary care-givers spend six months at home with a baby, and for many families, this would not be achievable without paid parental leave. Rising unemployment and fewer job opportunities makes it increasingly difficult for parents who have spent time at home looking after children to return to the workforce. In many ways, providing paid parental leave, along with affordable childcare, is the ideal way to support families. It allows parents to maintain important work connections and increase workforce participation. The Federal scheme, 18 weeks paid at the minimum wage, ensures equality for all new parents. Employer paid leave, an average of 9.7 weeks, provides an opportunity for the employer to attract and retain skilled employees, with clear cost benefits for the business. A complementary system of paid parental leave makes sense economically for the nation and for businesses. Parents receive a minimum entitlement, which can be built on with employer provided benefits, giving businesses and parents an opportunity to negotiate good outcomes for work and family. Around 50 per cent of employers now make the home/work balance easier by providing, as part of employee entitlements, access to paid leave through maternity and paternity payments. This is a huge increase from 2002 when only 39 per cent of employers provided paid leave, and in 1997 with only 28 per cent. Providing paid leave is a good business practice for employers. It encourages loyalty from employees and sets them apart as an “employer of choice”. Providing paid parental leave also saves businesses money. At a rough estimate, the direct and indirect costs associated with recruiting a new employee who leaves within 12 months amounts to between 50%-65% of that employee’s annual salary, with the percentage increasing as the annual pay goes up. One of the key ways for businesses to attract and keep female employees of child-bearing age is to pay parental leave. It makes no sense at all to make employer paid parental leave an unattractive proposition. It takes away bargaining power from employers and employees and reduces market choice. And like any other benefit negotiated in addition to minimum entitlements, it comes at a cost to the employee. In the same way people who access additional weeks of paid recreation leave sacrifice a part of their salary, so too do many corporate and professional women who negotiate paid parental leave, usually in the form of a lesser total annual income. If employees are willing to negotiate additional benefits with their employers, it should be applauded, not discouraged by Government policy. Paid parental leave is part of the evolution of federally-funded support for families. The Commonwealth scheme provides minimum entitlements. It creates certainty and equality for all parents in the workforce, enabling them to spend as much time as possible at home with their child without the stress of financial hardship. Since the Federal Paid Parental Leave Scheme was introduced by the Labor government in 2011, there have been improvements in maternal and infant health, and increased workplace participation. The cost of $11,539 per child to allow a parent to take 18 weeks of paid leave is significantly less than the costs associated with paying for poor health outcomes or other types of benefits. Australia is well behind the rest of the developed world when it comes to supporting women in the workplace. Sweden introduced a universal paid parental leave in 1974, which now provides 60 weeks of paid leave. The United Kingdom scheme, introduced in 1999, now provides 39 paid weeks. In Canada, mothers have access to 50 weeks paid leave in a statutory scheme. And in 2010, the European Parliament recommended all companies pay maternity leave at full pay for 20 weeks and paternity pay for 2 weeks. The Australian PPL scheme, budgeted on the minimum wage for 18 weeks, should be a starting point. The cost per child, is significantly less than the amount the average full-time worker pays in tax per year ($17,364 based on a $74,724 pa income). Additional employer paid parental leave should be treated in exactly the same way as any other benefit negotiated above the minimum workplace entitlement. And the private agreements between employer and employees are not the Government’s business. A complementary system of PPL sets a minimum standard while still enabling employers the freedom to negotiate additional benefits for workers. It achieves a much-needed balance. And much needed support for working families. You can follow Eva on Twitter @e_cripps. Queensland’s ‘anti-bikies’ laws: Should you be afraid?